The summer of 1977 was when I started buying albums in earnest. I’d gotten my first job — doing data entry on the giant computer at my dad’s office — and whenever I got a paycheck, I would hop on my 10-speed and ride to Tower Records to buy a couple of albums. And on one those trips, I succumbed to the hype and bought Kiss’ Love Gun, because it was mandated by law in the mid-1970s that every teenage boy buy at least one Kiss album. And since Craig across the street had Alive! and my brother Joe had Destroyer, I went with Love Gun, which was . . . OK. 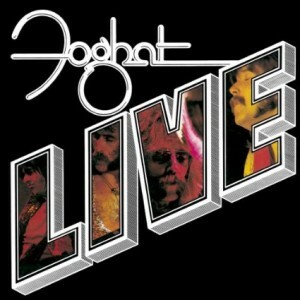 The other album I bought that day was and is an eternal classic 1970s live album: Foghat Live. Thanks to the massive successes of Made in Japan and Kiss Alive!, it had become a trope in the second half of the 1970 for bands to release live albums after a few records, especially if they’d had a few songs on the radio. The gamble was that the “greatest hits plus live energy” formula that worked for Kiss would work for other artists. So between 1975 – 1979, you had — and this is off the top of my head, so I’m definitely missing some — Live Bullet, Live: You Get What You Play For, Double Live Gonzo!, Live Bootleg, Alive II, Made in Europe, Unleashed in the East, Seconds Out, All The World’s A Stage, Yesshows, If You Want Blood You’ve Got It, Bursting Out, Cheap Trick at Budokan, Bob Dylan at Budokan, Some Enchanted Evening, Rainbow On Stage, Strangers in the Night and of course the monster monster Frampton Comes Alive!. All of these were recorded live, probably sweetened in the studio, and I bought nearly single one of these. And the ones I didn’t buy — I’ve never owned Frampton Comes Alive! — I didn’t need to, because everybody else around had them. As it turns out, the “greatest hits plus live energy” is a helluva formula. It meant that I could buy REO Speedwagon’s live album and hear a bunch of songs I might have heard on the radio and liked, as well possibly turning me onto songs by that band I hadn’t yet heard. But none of them — OK, maybe Strangers in the Night by my then-beloved UFO — were as great as Foghat Live. I mean, Foghat was basically a boogie band from England who had a couple of really good slide guitarists in Lonesome Dave Peverett & Rod Price but not enough songwriting chops to sustain an entire studio album. So why would they make such a great live album? For one thing, brevity. Foghat Live is a single album containing only six songs, two of which are covers. So that’s the songwriting problem taken care of. One of the covers was a huge bouncy version of “I Just Wanna Make Love To You,” which featured a huge guitar duet build-up and a piledriver central riff that is as powerful as it is familiar. And the other cover was a lightspeed version of “Honey Hush” which started with the riff that powered the fast part of Aerosmith’s version of “Train Kept A Rollin'” and doubled down on it every which way, with guitar solos that practically separated the speaker cones from their wires. After the intro of “Ladies and gentlemen, pleaseee welcome Foghaaaaaaat,” it comes crashing in, telling the story of a city dude who’s ready to get back to the energy of the city. The studio version was pretty good, and definitely got some radio play, but it also suffered from some studio overarrangement, which detracted from the momentum. And the live version is all momentum: Dave Peverett is heading for the city as fast as he can: he’s homesick, he misses the grit, he’s a fish out of water, he needs to hit the streets as fast as he can. I’m a fool for the city. The live version of “Fool For The City” does everything you want from a live version of a song: it adds power, it adds energy, it adds roughness without ever losing the original arrangement or melody. It was the perfect way to open a live album, maybe not quite as great as “Highway Star” or “Young Man Blues” or “Kick Out The Jams,” but definitely better then the vast majority of contemporary live albums.